We have a need for boxes at 2 Pillars Near South. Medium size and large ones would be fantastic! 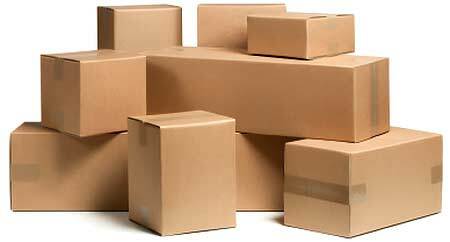 If you have any boxes at home that can be used for packing, please bring them to the church building and leave them in the office area. As we prepare to exit our building at 15th and South as well as our 2PC Northeast office space on Havelock Avenue, we've slotted Saturday, December 9th, and Sunday, December 10th, as two days for moving the majority of stuff into storage in prep for going mobile in January. Prior to December 9th, our aim is to have most areas packed up. We'll then have a large moving truck rented and ready to load beginning Saturday morning (the 9th) at 9am at 15th and South. We can use as many hands as possible to help with the move. We'll likely be at it most of the day so come and go as you need to. We're planning to rent the moving truck through Sunday so if we don't get done on Saturday, we will plan to finish on Sunday afternoon. We'll also be cleaning that weekend so if moving isn't your thing, please come to help clean! With a 'Merge & Move' and the Christmas season just around the corner, it's safe to say that we are in the midst of an exceptionally busy season as a church. With that in mind, here are a number of key dates and events to be aware of over the next few months. You might consider pulling out your calendar and taking a few minutes to mark these down. Of course, we'll continue to post details about the dates below as they emerge, so stay tuned! Q & A built into the 2PCNS and 2PCNE Sunday morning services. Celebrate Jesus and 1430 South Street! As we keep looking forward to merging and moving, we're also keeping an eye on the calendar! At 2 Pillars Near South we will continue to meet in our building at 1430 South Street through the end of the year; however, we've also got to be out of here by the end of the year! That means between now and the end of the year (including working around holidays), we will be slowly packing up and moving out of 1430 South Street. One of the big areas of packing up and moving out includes the auditorium. To that end our musician leaders are planning a "tear down" day this Sunday evening, November 26th, when a hand-picked team of music gear ninjas will start to carefully deconstruct and pack up our A/V equipment. Before they do that though, they'd also like to invite the entire body to join together for a time of singing and prayer that afternoon—from 3:00-3:45pm. Come one, come all, and spread the word for celebrating Jesus and 1430 South Street together, this Sunday, at 3pm!!! We received word from the Piedmont Seventh Day Adventist Church (at 48th and A) that their board voted this past Monday night to proceed with renting out their building to us on Sunday mornings! At this point, there are still several details to work out in order to finalize the agreement, so please keep this in prayer. Once the deal becomes official, we'll post more information but as of now, we simply wanted to share that this seems to be the direction God is leading us for our temporary Sunday gathering space need beginning in January. As we look forward to January and the transitions coming our way, one of the biggest remaining questions marks for us is the location of temporary meeting space beginning January 7. Our original plan was to begin meeting together in January at the Joyo Theatre (the current meeting location for 2 Pillars Northeast); however, after further consideration we believe that location is not optimal—primarily due to the challenges associated with having enough space to effectively conduct our Little Pillars ministry. We have at least eight other leads that we have been doggedly pursuing and are currently narrowed-in on 2-3 options. Pastor Adam and myself have been touring these options the last couple of weeks and are currently waiting to hear back from one of them which should aid in landing on a decision soon. 2 Pillars Church is Merging & Moving! Beginning in January 2018, in pursuit of health and strength, 2 Pillars Near South and 2 Pillars Northeast will recombine into a single congregation. Since planting 2 Pillars Northeast in February of 2016, 2 Pillars has existed as one church consisting of two neighborhood congregations. This transition simply brings the congregations back together as one church, one congregation. The recombined congregation will begin meeting in temporary space (location yet to be determined) on January 7th until settling in to a new location at 40th and Sheridan around Easter time. This is a season of great change and great opportunity for our body. To keep up with the latest information regarding the changes and transitions, stay tuned here to the 2PC Blog. You can subscribe via RSS or have new posts delivered right to your email inbox. In a few short days, the Haymarket will be transformed and filled again with the sights, smells and sounds of the Farmer’s Market. It will start at 8 a.m. on Saturday, May 2 when the opening whistle blows. As always, each year brings new vendors and produce to the Lincoln community. This prized Lincoln tradition has a strongly rooted history in our city’s past and present. To read more on those, check out my posts here for the history of the farmer’s market and here for where we are today! For the Christian Church, the Easter season evokes symbols of death, rebirth, and the promise of salvation. Every year, Christians celebrate Christ’s death and resurrection and what it stands for with the understanding that the death and resurrection of Christ mirrors their own “rebirth.” While the means and duration of spiritual rebirth can and do vary tremendously from person to person, the eventual result, a life evidencing the changes that come with knowing Christ, is the same. As the oft-quoted passage from the Gospel of John tells us, “whoever believes in Him should not perish but have eternal life.” While some throughout history have heatedly debated what constitutes “belief” - and Christ did make clear not all who profess belief actually believe - most would agree that the end result is a changed life that bears the “fruit” of the gospel as it compels Believers to live out its mission and tenets. For me, my rebirth elicits a series of contrasts between my life before Christ and my life after Christ. Before knowing Christ, I earnestly believed that my righteousness was of my own doing. I believed in living “uprightly” because of how I thought I would appear to others and because of what I thought I could gain from it. My upright lifestyle, I believed at the time, would help me be esteemed by others and would make me a better candidate for “making it” in school, in jobs, and in my social circles. Before knowing Christ, my self-made righteousness allowed me to willfully cover up and ignore my sinfulness. Since my righteousness was of my own doing, I frequently bent my self-made rules to suit me in the event I fell short of certain standards. In my own eyes, I was righteous - or better yet, more righteous - because I didn’t swear as much as others, because I studied more diligently than others, because I didn’t go out and drink like others, because I didn’t get angry about the same things as others, because I didn’t lust as openly or in the same ways as others, and so on and so on. Before knowing Christ I invested myself into my work and image with reckless abandon. For example, I had a love for sports that far surpassed a love of just the game itself, the friendships it fostered, the lessons it taught, or the enjoying the opportunity to witness feats of athleticism. I poured an immense amount of my self-worth into athletics. I embodied the coaching cliche that “you’re only as good as your last performance,” riding the volatility of every good and bad performance as either a validation or indictment of my personal being. In many ways, my deep identification with athletics was a perfect representation of how I approached living – each performance measured how “good” or “bad” I was. This is just a snapshot of how I used to live and what used to drive me. In the years that have passed since committing my life to Christ, I have seen Him already work changes in my life. First, my relationship with my sinful fallenness has changed. While almost two decades of self-made righteousness can’t be reversed quickly or easily, I have found great comfort in knowing that my salvation does not rest on “my last performance.” I am still sinful and broken. Very much so. I still wrestle with sins that have followed me from the time before I knew Christ. In fact, knowing Christ has greatly amplified my awareness of my sin now that I realize how short of God’s standards I fall and how shallow and feeble my own self-manufactured standards really were. However, my fallenness is no longer what defines me. Because of my understanding of the sacrifice that God made for me and all others, I am free to pursue good and resist sin, not as a means for appearing better to others or to appease God via some giant, cosmic scoreboard, but rather as a way to gratefully, diligently, and contentedly serve a loving, merciful God. A second major change is that knowing Christ has revolutionized my understanding of the Church. Previously, “church” had been a stale service that I attend for about 90 minutes every Sunday (or every other) because my parents went or because I wanted to look good and upright in front of others. “Church,” to me, was just another extra-curricular to join solely for the purpose of enhancing my appearance. Now, however, I understand that the Church is not a building that sits mostly empty six days out of the week but rather it’s a vibrant body of Believers that I am excited to be a part of and share in their experiences as followers of Christ. I am energized by their community and sense of mission, and I look to contribute to its mission of proclaiming the Gospel and living it out. This hasn’t meant that I’ve somehow become more eloquent in talking to others or less awkward in having serious spiritual conversations with others. I’m still the same bumbling conversationalist that I was before knowing Christ. However, when I have (or make) opportunities, I make efforts to make my identity known and speak Christ’s truth into others lives, either through actions, deeds, or both. A third major change brought by knowing Christ is that God no longer appears as a “celestial killjoy” to me. God was and remains a God of holiness and justice who abhors sin, but I now understand that it is through that holiness and justice that He offers hope to a broken, hurting world, promising us that one day all things will be made right and new through Him. This is possible because God is also a forgiving, loving God. He willingly paid the horrible penalty necessary for humanity to be redeemed and reunited with Him in eternity, and in paying that price and rising again, He defeated the hold that sin and death had had over us. Despite my horrible brokenness (and my tendency to revert to seeing Him as a scowling, disappointed patrol cop), I know that He loves me perfectly and fully. It paints a sharp contrast for a journey I know I’ve only just begun. As Christians, it’s okay for us to be happy. In fact, we should be happy. Jesus is alive, He has conquered the grave, He has united us with Himself, and though in this world we will have trouble and tribulation, Jesus commands us to be of good cheer (to “take heart”), for He has overcome the world. Within our stream of Christianity, there has been a bit of a reaction (a pendulum-swing, if you will) against the shallow, fake, overly-contrived emotional happiness of the contemporary church. As with most pendulum swings, however, we’ve over-swung—rejecting the idea of that happiness has a place in the Christian life at all. As Christians, we stand and affirm the truth that God is good. We sing that “God is good… all of the time!” We affirm and believe that Jesus died for our sins, that He reconciled us with God, that He rose from the grave, that we are united with Him in His resurrection, that He has ascended back to heaven, and is preparing a place for us. We affirm and talk about and re-iterate that the gospel is “good news.” And yet often times we don’t live as if we’ve heard any good news in weeks. We worship without smiling. We pray for change but not contentment. We talk openly about our sin and our struggles but not our victory or our hope. We pray for our needs, but don’t bask in His present provision. We confess but we don’t adore. We pray but we don’t praise. It’s easy to be sad. It’s easy to be discouraged and to point out everything that is wrong that needs to be fixed. Being a critic or a cynic doesn't take much work. We have to wrestle for contentment. We have to wrestle for happiness. This is a wrestling match that is worth winning. Such wrestling and striving doesn’t downplay how hard life can be. It doesn’t downplay the brokenness and fallenness that we live in. It doesn’t downplay suffering or pain or loss or depression. And at the same time it doesn’t elevate happiness as the greatest good thereby negating any benefit that suffering has in this life. Instead, it should lead us to understand what Paul meant when he said in 2 Corinthians 6:10 that we can be “sorrowful, yet always rejoicing… having nothing, yet possessing everything.” In some ways, it’s a perspective change. A change to seeing our lives the way God sees them. Enveloped in His glorious grace; encapsulated within in His sovereign and glorious plan. Beginning Easter Sunday morning and running for two weeks post-Easter, we'll be taking some time as a church to look at what it means to wrestle like this in a series we've titled, Happy: Wrestling for Contentment in Light of the Resurrection. My prayer is that this series would be transformational corrective to our view of happiness as Christians. From the street, patrons are greeted by a “Sorry We’re Open” sign, giving the initial down with the man, support local, live outdoors vibe. Upon entering, a neon pterodactyl is mounted behind the register while a vinyl Elvis hangs crying on the left. A lot of their decorations have been found at yard sales or picked up at thrift shops. Family members add their own vibe to the place with the one of a kind pieces they add to the walls and ceiling. If you have spent any time around the Near South Neighborhood area, you probably have heard of Grateful Bread/Freakbeat Vegetarian. Grateful Bread is a cash/check only family run restaurant located in the Near South Neighborhood at 1625 South 17th Street. This week, between bites of Cheese Scones and Moroccan Tomato Soup, I picked the brain of Cheyenne Flotree, front of house of this hip local joint. Grateful Bread was the initial bakery started in 1992. Cheyenne’s explanation began with, “ Well, my mom was kind of a punk, and my dad was a hippie.” Cate Flotree sold baked goods with the help of her husband for several years. With the quippy name play reference, the Flotree parents sound like they were “Dead Heads” in their day. In 1998, the bakery moved into a brick and mortar storefront, adding macaroni and soup to the menu. It was during this time they also added Freakbeat Vegetarian to the name helping possible patrons understand the establishment offerings. How is Grateful Bread/Freakbeat Vegetarian different than other local shops? Cheyenne believes the café stands alone. While being completely vegetarian definitely sets the shop apart from others, Grateful Bread also has a different vibe than many local hot spots. The menu is inspired by southern soul food with influences from India and Morocco. Cate Flotree scours various recipes looking for inspiration for new menu items. Not sure what to try? The Lunch Room macaroni reminds me of homemade, but better. Moroccan Tomato Soup has the perfect amount of kick with a peanut undertone. Do not skip out on the baked goods! I always get a Classic Cheese Scone or cookie offered for the day. This spring, Lincoln’s Near South Neighborhood Association will honor Bertram Goodhue, the architect of Nebraska’s State Capitol, with the construction of a monument at the intersection of Goodhue Boulevard and A Street. Funded by a $2,500 grant from NeighborWorks Lincoln, the monument, according to Association member Brayden McLaughlin, is intended to inform the public about the history of the area. “We’ve always kind of wanted sort of a marker at the end of Goodhue. It’s been kind of an entrance to the neighborhood that’s been overlooked,” McLaughlin told the Lincoln Journal Star last September. The monument will be constructed of a concrete base and will be topped with an engraved plaque containing information about Goodhue, the Capitol, and the surrounding Near South neighborhood. The Near South Neighborhood Association hopes to have the marker installed prior to the Near South Neighborhood Association's Parade of Homes on May 10th. Despite the considerable honors of a monument and having a broad, grass-medianed boulevard named after him for his contribution to the city, Goodhue never actually saw his finished masterpiece. The notoriously prolific architect, who was known to keep lit cigarettes at several different work stations as he rapidly moved between them, died of a sudden heart attack in 1924 while half a continent away in his home city of New York. 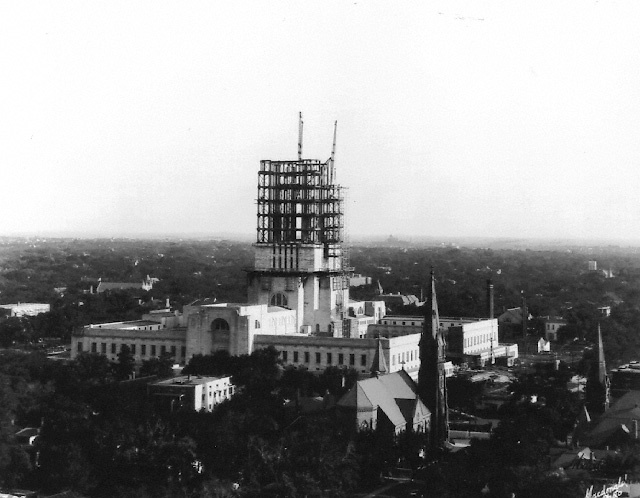 Despite having only broken ground on the Capitol in Lincoln just two years earlier, Goodhue’s plans were sufficient in detail for the project to push ahead unabated. In fact, Goodhue had been so prolific that his associates were able to continue working on the deceased architect’s projects for over a decade and a half until his firm finally closed in 1940. Perhaps the most important contrast created by Goodhue’s new Capitol was the permanent change that he brought to the prairie skyline of eastern Nebraska. The Capitol in Lincoln would undoubtedly seem much more at home nestled among the skyscrapers of Goodhue’s native Manhattan than perched solitary and conspicuous above the flat, treeless plain that surrounds Lincoln. With the coming of the Capitol, Goodhue seemed to bring to Nebraska an implicit sense of vision and an apparent optimism that the state his project represented might one day grow to fit the monument he was building to it. Coming on the heels of recent national praise for the city’s growth and development, the City of Lincoln and the Near South Neighborhood Association hope to honor the man who helped give shape to that vision. Let me introduce you to one of my favorite places in all of Lincoln. Only coming in behind my cosy Cape Cod and my workplace, this is my third home. Everyone, meet Destinations. Now, why would a place like this exist? Why would young adults volunteer here, when they could be spending their time and energy elsewhere? As a volunteer of nearly three years, let me explain the special bond that draws together people of varying backgrounds and unites them to the mission of Destinations. After all, Jesus didn’t just hang out at the synagogue. He hung out at wells, and wells were the natural gathering places in ancient culture. One day it dawned on me that coffeehouses are postmodern wells. The only difference is that we draw shots of espresso instead of drawing water out of a well. Those of us who serve as volunteers - even as our group continues to shift with each year - have a desire to create a warm, welcoming, and encouraging environment for students. We want to provide an extension of God's love to those who walk through our doors. There's something about greeting someone with a smile, asking their name, acknowledging their uniqueness, asking about their major, then serving them a handcrafted beverage, that can hopefully add joy to their day. It's only a cup of coffee, but it may be the interaction of the volunteers that make them want to come back, knowing that they are loved here - even if they don't know why. The hopeful ripple effect of what this induces in the lives of students is what keeps us washing the dishes and wiping the countertops. It's a slow process - "relational evangelism," if you will - but it is good and worthwhile. Consider the stigma of someone walking into a church for the first time, fearing judgement. At Destinations, we can welcome people with God's love in a way that is different - for one, it's less scary, and, let's be honest, it probably has better coffee. We welcome everyone at Destinations, not just students! We have free parking, which is a sweet bonus. We want to know you - come meet us! That is the mantra of Maggie Pleskac, owner of Maggie’s Vegetarian Café located in the Lincoln Haymarket. Maggie is one of the founding members of Slowfood Nebraska. Maggie’s passion for organic eating was discovered when she was living in California. When she returned to Lincoln in the late 1990s, she decided to try to bring California’s fresh organic eating back to Lincoln, and in the process, support Nebraska producers. The result was the opening of her small restaurant in July 2000. Upon entering the cafe, a sign reads, “Know your farmer. Know your food.” Maggie takes this to heart, utilizing products from local producers year round. Some of her local sources include Jisa Farmstead, Dutch Girl Creamery, Branched Oak Farm, and Wise Oven Bread. Food is never inert energy. Although we pluck it from earth or its mother plant, prepare it or cook it, food holds and irreplaceable and complex set of memories that inform the vital functions of the body, mind and spirit. Although small in size, Maggie’s is mighty in flavor. In September 2012, Food Network Magazine voted Maggie’s Avocado Melt Wrap, “The Best Sandwich in Nebraska.” After trying several of the wrap options, I have to agree with Food Network Magazine, the Avocado Melt Wrap is vegetarian heaven in your mouth. The wrap uses fresh avocado, Jisa Farmstead cheddar, provolone and mozzarella cheeses, roasted sunflower seeds, onion, fresh tomato, mixed greens, and house made Herb Mustard Dressing to create an experience unlike any other. You can visit Maggie’s Monday through Saturday from 8am to 3pm. If you don’t get off work before 3pm, you can always find a few of Maggie’s wraps or baked goods served down the street at The Mill coffee shop. The following is a guest post by Andrew Stellmon. Andrew is a Team Member at Vinnie Krikac State Farm, and a frequent contributor to HearNebraska.org. Originally from Lee's Summit, MO, a suburb of Kansas City, he has lived in Lincoln since Fall 2007, when he began attending UNL. Andrew graduated in May 2011 with a Bachelor of Arts in both History and Sociology. Andrew has contributed to HearNebraska.org since April 2014, and what began as an outlet for his passion for music turned into a position as an editorial intern for the Fall 2014 semester, covering local and national music in concert and album reviews and artist-focused interviews. Andrew also loves movies, coffee, craft-beer, tries to find time to read, and is a rabid Kansas City sports fan. After 61 bands, four nights, three venues, and after one awesome local music fan base turned out in droves, Lincoln Exposed ended with a bang early Sunday morning. It seems too neatly linear, and maybe a bit cliché, to say that Lincoln Exposed ramped up as the weekend progressed. It's still true in a lot of ways. Wednesday night opened with seven bands, and even with a bone-chilling freeze outside, drew a nice turnout. After expanding to the full complement of venues - the Zoo Bar, Duffy’s Tavern, and The Bourbon Theater - for Thursday onward, the number of bands increased, as did the attendance. Twenty bands played on Saturday, starting with Tupelo Springfield at 6pm at the Zoo Bar. The energy of Saturday itself intensified as the regular bar crowd showed (especially at Duffy’s, where it was at capacity for part of the night). The festival hit it's last crescendo with pop punk quartet Thirst Things First at 12:40am at Duffy’s to close the weekend. Whew. What an awesome whirlwind of a weekend. I helped cover Thursday’s festivities for Hear Nebraska, which is part of why I wasn't able to make it to every band. Visit these links for their comprehensive coverage of Lincoln Exposed Wednesday, Thursday, Friday, and Saturday. There was still plenty to digest from the weekend. I’ve listed my thoughts below, based on my favorite things that I saw, sought out, and experienced randomly. I wrote a bit last week about how diverse, genre-wise, these billings were at first glance. For my money, that is when Lincoln Exposed, Lincoln Calling, or music festival is at its best: a wide variety of acts playing one after another on the same billing or throughout the same night. It gives musician and audience member a chance to sample something completely different from their particular musical tastes. Lincoln Exposed delivered on this in spades each night, beginning right away with Wednesday’s billing. Soul/R&B trio Xion played first at the Zoo Bar. Their three-part vocal harmonies blended expertly together with VJ Herbert’s robust piano chords. It was nice to ease into the festival in this way, gently and with music that would probably be unlike anything else over the next few nights. The crowds would be different for Orion Walsh and the Rambling Hearts later in the evening, and around the corner at Duffy’s. Folk act Jack Hotel played with indie bands blet and Oketo. It would be redundant to list every single example of this, but there are few highlights that help drive the point home: Thursday’s entire night at the Zoo Bar, from Root Marm Chicken Farm Jug band to avant garde electronic Omni Arms to prog-punk band Universe Contest; two country bands - Dylan Bloom Band and Emmett Bower Band preceding Laughing Falcon and Bogusman, two of the loudest rock/punk bands in Lincoln; and Saturday, where Americana (Gerardo Meza) and alt-rock (the Renfields) shared the stage with trumpet-accented garage rock (the Crayons). Lincoln Exposed offers a unique opportunity to see not only a wide array of musical acts, but ones across the spectrum of experience. This year saw a number of rising young talents play alongside veteran Nebraska musicians, some of which were also testing new material. I kept thinking all weekend about the idea of a “bandleader,” what that can mean, and how its embodied differently by different artists. There were plenty of candidates for emerging bandleaders: Stuart McKay of funk band Melon Company, who held together a tight brass ensemble and funky rhythm section; JP Davis, who led a mini-orchestra-sized band with droning lead vocals and subtle charm; Steven DeLair of Oketo, who shifted skillfully between cooing tenor and guttural screaming. There were plenty of accomplished frontman as well, including Meza, backed on Saturday night by the new band he unveiled at Lincoln Calling in October. Evan Bartles and the Stoney Lonesomes played the Zoo Bar Friday, Bartles himself a strong, intense bandleader. Then there’s Mikey Elfers of the aforementioned Thirst Things First, who closed down the festival with pop punk explosion. He is that band’s “leader” insofar as he its lead singer. But he also plays Boot, the overlord-subject of their sci-fi backstory, in videos that play onstage. He also assembles and customizes each show beforehand, splicing Sonic the Hedgehog-style bleeps and bloops into the track of each show. Speaking of that band: what one must have thought upon walking in on them for the first time if they had never seen or heard of them before. Its such a bizarre gimmick, even as its one of the most fleshed out concept bands around. That awkward feeling is blown away as soon as they begin, as it did on Saturday. Their sound is too infectious, which is why they draw some of the biggest crowds of any local band. Two other crowd pleasers (and two of my favorites) played back to back nights at the Zoo Bar. Universe Contest played Thursday night as what has become an all-star lineup behind frontmen/guitarists Tim Carr and Joe Humpel. Festival-goers packed the room as beer cans flew into and past the band. With violin and Moog synth replacing atmospheric keys, they brought a punkier vibe to both their old songs and new material. Friday night overflowed again as garage punk foursome Halfwit played what will be its last show for a brief hiatus. The two bands share bassist Saber Blazek, whose presence brings precise, rhythmic notes and one of the most noted stage personalities for a non-frontperson. Unsurprisingly, the energy was in the stratosphere for both shows. Lincoln Exposed can seem like a huge blur of memories, with ones that stick out like cottages dotting the countryside outside of a speeding train’s window. Whatever you remember, it's likely been demonstrated that the musicians, songwriters, and bands of Lincoln possess such creativity and talent. It's nice to see such support from fans. Art is an essential component of any city with a vibrant culture; Lincoln’s music scene is important in that regard. It remains strong and diverse, and Lincoln Exposed was yet more proof of that. The following is a guest post by David McGee. David is a native of Omaha, but has been in Lincoln for nearly 15 years and now calls it home. He is a recent graduate of the University of Nebraska at Omaha where he majored in Nonprofit Administration. David works for the State of Nebraska in the Purchasing Department and also covers University of Nebraska athletics for cornnation.com as a writer and photographer. He has been actively involved at Grace Chapel for nearly his entire time in Lincoln and during the spring and summer months spends many evenings playing in various recreational softball and volleyball leagues. He is also on Twitter at @dpm917. David talks mostly about sports so if that isn't your thing, you've been warned. This Saturday, February 7, join in on the love spreading! From 10:00am to 6:00pm, Porridge Papers will be hosting the 8th Annual Love On The Run Event. The event is open to everyone, so come early and enjoy! For more information, check out Love On The Run on Facebook. Whether you’re a diehard fan of local music, or you’re interested in becoming one, its no exaggeration to say that the upcoming weekend is one of the most exciting of the year. Beginning tonight, and running through Saturday, more than 60 local bands and hundreds of fans will converge on downtown Lincoln for Lincoln Exposed. The tenth annual local music showcase will feature everything from Lincoln music veterans to bands breaking into the scene and looking to make their mark. The four night event stands apart from its autumnal counterpart, Lincoln Calling, in a lot of ways. This past October, as it has in previous years, Lincoln Calling mixed bands from across the state with touring acts on eight stages around downtown. A few of those bands were Lincoln regulars like The Kickback and Sidewalk Chalk, both from Chicago. With Lincoln Exposed, the festival is confined to three venues in close proximity - The Zoo Bar, Duffy’s Tavern, and The Bourbon Theatre - and will feature only bands which have Lincoln origins or close ties. The lineups are diverse in term of genre; if a festival-goer chose to remain at just one venue each night, they might hear a jug band, electronic rock, and progressive rock all on the same stage. However, the schedule is staggered, with a band starting every 20 minutes. With enough planning and hustle, the same patron could see every single act of the weekend. The festival is important locally on a number of levels. Not only does genre diversity echo the wide variety of talent that resides in Lincoln and the rest of the state, its a celebration of the city's vibrant music scene. The fact that it happens to coincide with First Friday is an excellent reason to catch both art exhibit and rock show, but also speaks to the strength of the arts and culture in Lincoln. Simply put, it's an opportunity to enjoy the wealth of musical talent Lincoln has to offer. Wednesday, the Bourbon is hosting a different event, so the action is confined to The Zoo Bar and Duffy’s. Fast rising indie rock six-piece Oketo will close the night at Duffy’s. They released an EP in October 2014 and are gearing up for a midwest/west coast tour that will stretch from February through May. Orion Walsh has often played as a solo act over the last few years. After returning home from cross-country touring and travels, he has lately performed with a full band, the Rambling Hearts. He will do so at the Zoo Bar Wednesday, adding a little kick to his Americana. I mentioned the jug band/electronic/progressive rock billing? That would be Thursday night at the Zoo Bar, with Root Marm Chicken Farm Jug Band, Omni Arms, Powers, Red Cities, and Universe Contest. Aside from its identity crisis, there’s a lot to love about this lineup. Root Marm is undeniably quirky and fun roots music. Universe Contest is a scene favorite and, with a newly shuffled lineup, look to unveil new songs and shed the spacey electronic layer of their prog rock sound for a more punky edge. Watch for flying beer cans (from crowd to stage, a staple at UC shows), and any combination of costumes, glitter, and balloons. A musician of note: Powers and Universe Contest share drummer Jordan Elfers, and he should be one of the most exciting to watch all weekend. In fact, you can also catch him late Saturday night playing for pop punk band Thirst Things First. Friday night at the Bourbon features Tie These Hands and Once A Pawn, both of which have long been active in Lincoln. Sputnik Kaputnik, which released a double album in November, will play in between them. As will Bud Heavy & the High Lifes, who I saw for the first time in October for Lincoln Calling (their set is reviewed as part of this coverage from Hear Nebraska). Bud Heavy plays punk infused folk rock at breakneck speeds, and will also engage in plenty of crowd interaction. That Hear Nebraska link above also features photos of sludge punk band Bogusman, which will perform at Duffy’s Friday as part of an extremely loud couple of hours. They have been playing around Lincoln and Omaha quite often as of late, and are starting to hit their stride (read a review of their November performance at Urban Outfitters here). Saturday is jam packed; if I already didn’t wish I had a Time-Turner for the entire weekend, it would be great to have that night. If I had to highlight a few can’t-miss options: Gerardo Meza (for his beautiful songwriting and charismatic stage presence); The Crayons (for their primary-colored outfits and trumpeter David Tysdal hopping about the stage); The Renfields (for their sunny early 2000’s indie sound); A Ferocious Jungle Cat (for dance-inducing grooves); and the aforementioned Thirst Things First (for their energetic pop punk and accompanying video transmissions). Lastly, note on the schedule that Wednesday and Thursday are ages 18+, and Friday and Saturday are 21+. All access passes are $20, but you can also pay by the night. Wednesday tickets are $5, Thursday tickets are $6, and both Friday and Saturday tickets are $8. If it seems like I’m trying to sell you on this, you’re right! But it promises to be an entertaining weekend for any music lover. If it would be your first Lincoln Exposed, I am highly recommending it. If it’s your first ever foray into local music, I’m practically begging you to go (but only because you’d be doing yourself a favor, and because the idea of introducing more people to Lincoln music thoroughly excites me). Regardless, I look forward to seeing you there! I’m not sure the phrase “bad day” can ever be appropriately used to describe a sixty-degree afternoon in January, but last Sunday did its very best to earn that moniker. It started out with such promise. Not only was it nice enough to play Ultimate Frisbee, which normally requires a vacation to Florida this time of year, but it was also the last weekend of the NFL Playoffs. Championship Sunday is ordinarily one of my favorite days of the sports calendar because it is the last day for almost eight months where there will be more than one football game. Unfortunately for me, I’m not sure I have ever hated two football teams more than I hate New England and Seattle, who will now face off in a Super Bowl that will, at best, give me time to start filing my taxes while I wait for the commercials to come back on. The one positive of the day is that while the Patriots were beating the Colts, deflating footballs, and generally being pains in my behind, I was enjoying both the atmosphere and the food at Buffalo Wings and Rings. Buffalo Wings and Rings definitely isn’t Buffalo Wild Wings. I know that now. Was anyone else confused by that? No? Never mind. Located between Rule G and Vega right off Canopy Street in the Railyard, Buffalo Wings and Rings is a fixture of one of the best entertainment districts Lincoln has to offer. If the weather is nice, you can watch the game outside on a plasma screen roughly the size of my apartment, if the weather is cold you can go ice skating. If the weather is like it was last Sunday, you can do both. As a sports fan, Buffalo Wings and Rings doesn’t leave a lot to be desired. With most traditional domestic beers on tap, more televisions than I could count, and $2.00 off pitchers on Sundays, it really is a phenomenal place to watch football. Both times I’ve been there—last Monday during college football’s National Championship Game, and Sunday for the AFC Championship Game—the game I was there to watch was the only game on, but my feeling is that they probably mix it up a bit more on normal night. It is also perhaps worth mentioning that in both cases, my party was able to stay for the entirety of the game we had come to see without our waiter being awkward about it, which isn’t as much of a forgone conclusion as you might think. Buffalo Wings and Rings offer 69-cent wings on Tuesday nights, and kids under the age of ten eat free on Mondays. They also have an ongoing non-sports-related trivia challenge you can participate in while you wait for your food to come, if sports isn’t your thing. My verdict is that this might be the best place I’ve tried since I started writing these, even if parking in that part of downtown has a tendency to be an absolute hellscape. My only hope is that next time I go there, a domestic draw and a bacon cheeseburger won’t be consolation for another Super Bowl appearance by the Seahawks. My favorite way to see Nebraska is on a bike, so when the temperatures rose above 50°F this weekend I just had to go for a ride. There was a lot of traffic on the MoPac trail, so many Lincolnites must’ve had the same idea. Some of Lincoln’s choicest scenery is easily accessed just feet from busy 84th St. at the MoPac trail. The trail gets its name from the Missouri Pacific Railroad, which is the abandoned line the MoPac follows. Lincoln has over 131 miles of paved and rock trails, which I’m sure contributed to our #2 ranking for biking communities in The National Bike Challenge last year. The west leg of this trail begins at the University of Nebraska Lincoln and continues paved to 84th street, about 5 miles. The eastern portion of the trail is made of crushed limestone and goes about 22 miles starting at 84th St. and meandering through Walton, Eagle, Elmwood and Wabash. For information on the trails and resources available to bikers in Lincoln such as how to register your bike, plan your trip, and find local bike shops and organizations, visit Bike Lincoln. "The letter to the Ephesians is a marvelously concise, yet comprehensive, summary of the Christian good news and its implications. Nobody can read it without being moved to wonder and worship, and challenged to consistency of life," so claims theologian John Stott. But can a nearly 2000 year-old letter, written to people you've never met, in a completely different culture, context, and time really achieve that? How does it achieve that? What's so amazing about this letter that nobody can read it without being moved and challenged? To begin to answer that question, we should first realize that the first-century city of Ephesus was not all that unlike our own city of Lincoln in the present. At about 300,000 people in size, Ephesus was one of the largest and most important cities in it's respective area. It was a center for trade, commerce, politics, as well as recreation and worship. The Temple of Artemis (or "Diana") was there. Within reason, the Temple or Artemis was approximately the size of Memorial Stadium, made entirely out of marble, and regarded as one of the Seven Wonders of the ancient world. As the goddess most worshiped in private devotions in the Mediterranean world, thousands upon thousands of people flocked to the city of Ephesus to pay tribute to Artemis. While there, they spent lots of money and kept the local economy alive and thriving. Sometime early in the 1st century (likely A.D. 52), the people of Ephesus began to encounter the gospel of Jesus in a significant way when a missionary named Paul visited the city (Acts 18:19-20). Upon arriving, he preached the good news about Jesus to the Jews in the synagogue but did not stay long, leaving to move on but later returning to stay for two and a half years there (see Acts 19). When Paul did return, he found a city full of pagans as well as religious people (both Jews and non-Jewish God-fearers). Additionally; however, as we read in Acts 19, there were also some people who had heard about Jesus, believed themselves to be disciples of Jesus, but truly were not saved. Paul labored through tears and trials (Acts 20:19) for two and a half years in this city. During that time, the church was established in Ephesus. Some years laters (between A.D. 60-62) Paul wrote at letter from prison in Rome intended for the fledgling Christians in Ephesus. Some of the recipients (not unlike the makeup of a typical modern-day church) had been "religious" all their life but had only recently encountered the good news of the gospel of Jesus. Others were pagans who became believers and found themselves growing into leadership in the local church. Still others were those who believed they were Christ followers, only later to realize they weren't, who had since now become true Christ followers. These fledgling Christians now found themselves "marginalized in a pluralistic culture tolerant of many things but not of the Christian gospel or the church which proclaimed it." (Ferguson, Let's Study Ephesians). The letter to the Ephesians was thus written to encourage and instruct these believers. Perhaps the best summary of Ephesians is found in Ephesians 5:8: "For at one time you were darkness, but now you are light in the Lord. Walk as children of light." The order of that summary is important: Who we now are (in Christ) proceeds, undergirds, and drives how we are to live. This is the message of Ephesians. Ephesians is a letter that is all about who we are "in Christ" (the first half of the letter) and how we are to live "in Christ" (the second half of the letter). The divine structuring of the letter reminds us that everything we're to do is founded on all that Christ has done—in other words, our gospel identity forms our gospel life. This is a message that transcends centuries, cultures and contexts. It is the very heart of Christianity itself. And it's for this reason that none of us should be able to read the letter to the Ephesians without "being moved to wonder and worship, and challenged to consistency of life." Read. Wonder. Be moved. Be challenged.